Rarely available as Owner lives here part time. One bedroom with Tempurpedic queen bed/One bath with additional four poster queen bed in living room for additional sleeping. Tropical landscaping with ocean views from front of cottage. Covered patio for outdoor dining. The property location is ideal for exploring the sunny side of the island and retreating and can be you island home away from home. Beautiful beaches within a few minutes drive. Garden oasis with outdoor dining area which is great for breakfast and dinner. Or drive 5 minutes to Kawaihae where there are some lovely and fun restaurants and even live music. Beaches, towns, markets are a short drive away. Pattie will offer you great information on local farmers markets and fish market. Lovely tropical furnishings offering a convenient place to relax after a day of fun in the sun at several white sand beaches within 5 minute drive. Hapuna State Park, Mauna Kea Beach, Spencer Beach are so close. Owner chose this unique location because of it s proximity to 5 star resorts and sandy beaches. Kawaihae Village was built in 1971 for the workers of the Mauna Kea Hotel. There are 50 small homes in this enclave. Some have been upgraded but some are still fairly original. The neighborhood is a mixed combination of retirees and workers with a few vacation rental homes. Please don't expect a resort type neighborhood but you can expect quiet and peacefulness in great location. This is the sunny side of the island! Very rare if it rains. A few years ago I downsized to this cottage in order to travel more. This cottage is my place of serenity and peace and I enjoy sharing this piece of paradise with others who might enjoy the same. I love the location as it is possible to be at the beach in 5 minutes or the fabulous resorts. Can also be in the charming town of Waimea (Kamuela) in less than 15 minutes. On most Saturdays I visit the wonderful Farmer’s Markets offering fresh organic produce. My 2 young grandchildren are in California, so I travel there often and have designed my cottage in a way that others can enjoy it. 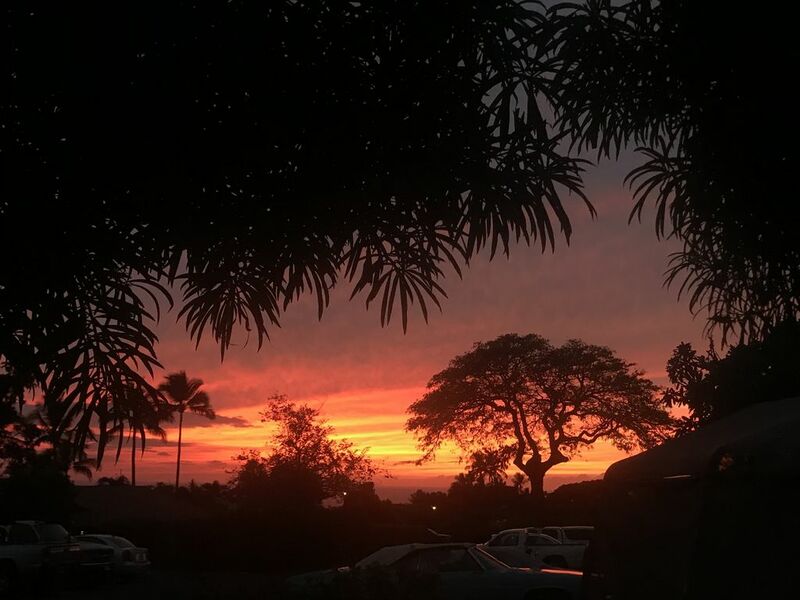 I owned a vacation rental business for 25 years here on the Kohala Coast and sold it recently so I feel I offer an exceptional property with all of the amenities that guests enjoy. My full time career at the Mauna Lani Resort as a Realtor. I chose this cottage because of the prime location so near the beaches, resorts, Waimea. Everything is conveniently located. My office is at the Mauna Lani Resort which is less than a 15 minute drive. Drive 5 minutes to the beaches on the Kohala Coast, Affordable compared to homes and condos in the resorts or Puako, yet you are so close! There are very few 'cottage' type properties in this area. Small, Clean and neat with nice towels. Second Queen bed is a beautiful 4 poster in the living room. In Hawaii it is known as Punee which is like a daybed. Fully equipped kitchen. Owner enjoys cooking. Owner has created an oasis in the garden. It is a magical place. Patio has a partial sunset view and is a great place to relax. At nearby resorts Hapuna and Mauna Kea Golf courses are less than 5 minute drive. Mauna Lani Golf courses are less than 10 minute drive. There are many more golf courses on the island to enjoy. Kawaihae Village is an enclave of simple homes built in the 70's. There are a total of 50 homes in this area. What makes it unique is it's close proximity to 5 Star resorts and beaches as well as historical sites. Great local restaurants are just a 5 minute drive down to the harbor.